February is Pet Dental Health Month! We are thrilled to review Merrick Mini Brush Bones Grain-Free Dental Chews, especially with Finn's needed dental procedure and 6 extractions last year. While his earlier life left him little hope for a healthy mouth, I have been focused on [almost] daily brushing and thought it would keep us miles from the dentist. Well, I'm happy to say Finn seems to be out of the woods now thanks to our routine and since we cut sugary foods out of his diet. BUT... Cooper chipped a tooth a few months ago... Now he needs x-rays and possibly an extraction but on the plus side, he'll get a full cleaning while he's under! And, while there is no replacement for a high quality diet and regular teeth brushing, I found the Merrick Mini Brush Bones to be quite effective. Finally, the Bones are grain- and gluten-free with no sorbic acid or sodium copper chlorophylinand. They contain parsley, a natural breath-freshening ingredient and they are easily digested. 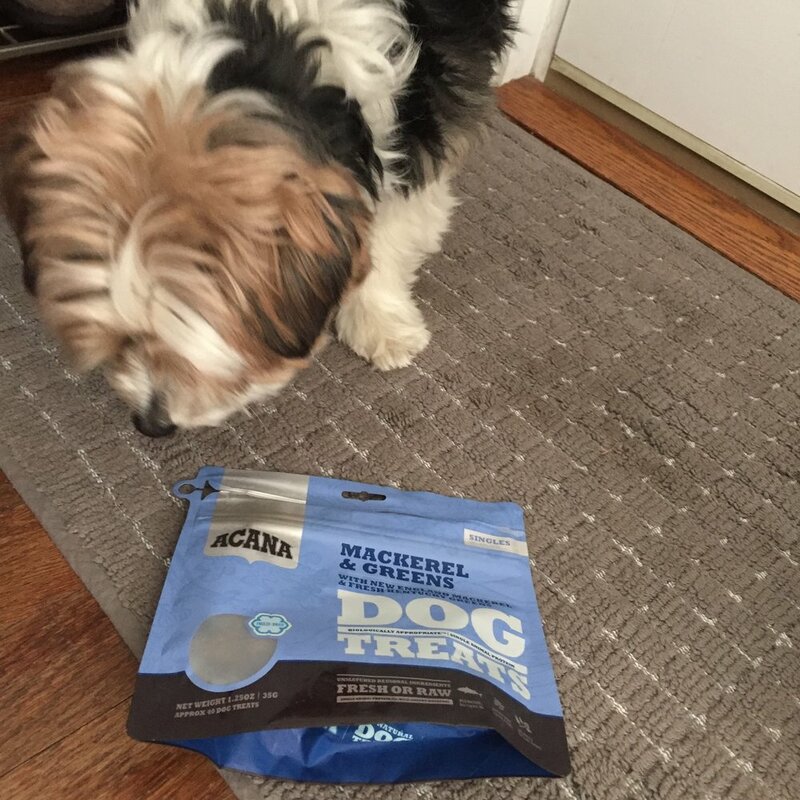 Ever since trying another variety from our dear friends Jackson and Wally, the boys were stoked to review the ACANA Mackerel & Greens Singles Formula Dog Treats earlier this month. With winter weight being a heavy topic for Finn, these limited ingredient delights were perfectly refishing ;) Plus, we're always game for non-GMO, grain-free goodness and we appreciate the benefits of freeze-dried nutrient preservation. To top it off, the Fresh Atlantic Mackerel was caught by a fishery based out of my hometown! The only downside here is stinky breath but the boys were still HUGE fans! In recognition of the holidays, we sampled some festive treats this month! The Merrick Grain-Free Wingalings biscuits are part of their Kitchen Bites line of snacks. The boys taste-tested the Applewood Bacon flavored variety and, as you can see from the pics, they [Finn] couldn't wait! These crunchy, chicken-wing-shaped delights are made with real, wholesome ingredients (save the applewood bacon "flavor") and are just the right size for my little guys. 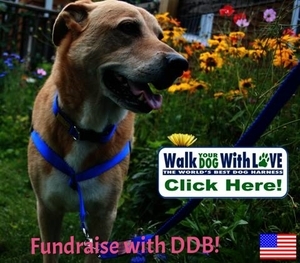 The 9-oz bag provides a very generous portion -- enough to fill a treat container that typically lasts us 4-6 weeks! Even though the treats crumble when broken or chewed, they are tasty enough that the Cooper 2000 and Finn XS vacuum up each and every last bit. Grain-free, they are; moist, they are not. Our Earthborn Holistic EarthBites Hip & Joint Natural Moist Treats arrived earlier this month courtesy of our favorite procurer of pup treats, Chewy.com. Cousin Zeph received a bag of the Cheese Flavor EarthBites™ in his welcome gift :) so, naturally, I wanted to give Cooper and Finn a chance to try these out, too! We had high hopes given that Earthborn Holistic is a great brand and the ingredients listed were all legible (lean turkey meal, peas, apples, blueberries, carrots, spinach...) and that's hard to come by sometimes! As you well know, Cooper chows down on everything but he really gets excited about the very meaty, smelly treats. And Finn had a funny way of eating these, given the extra crumble they presented. They were easy to break, crumbs and all, so I did find that they made a good Kong stuffer. I just chose against bringing these on our walks because my pockets would have been left with lots of "Hip & Joint" residue. I also noticed they had a very faint aroma which made them a bit less enticing than your traditional protein-rich snacks. On the plus side, they were rich in Omega-6 and -3, anti-oxidants, and glucosamine for joint heath and skin care. All-in-all, 2 out of 4 paws up! In April, we started strong with the Blue Buffalo Wilderness Wild Rolls. The flavor of the month was the Grain-Free Duck Recipe. Firstly, RIP little duck friend. Secondly, thank you for getting the dogs so pumped at treat time! The food roll, while nutritious enough for a standalone meal, is perfect for just about any use. It can be sliced or crumbled in small bits as a flavor boost to bland kibble or it can be cut to size for rewarding all sizes of (adult) dog. Tip: Since there are no artificial preservatives and the moisture level is higher than most treats, be sure to keep the opened roll/pieces in the fridge or store the unopened roll at room temp. You can also freeze it before using but "enjoy" by the date stamped to ensure freshness! Put down that raw hide and do away with those splintering bones! A nice reward for waiting patiently while I take conference calls from home or have dinner with friends, bully sticks are always popular in the Cusson house. This month, Chewy.com sent us a scrumptious 5-pack of 6-inch "I and love and you" Free RangerTM Bully Stix. As 2-pup household, I really prefer even packaging :) It's like the age-old question of why hot dogs are sold in packs of 10 while buns come 8 to a bag! And they were not of the no stink variety -- although that is offered by this brand -- so air circulation was a must. Some of the benefits to treating with bully sticks include: reducing tartar buildup, introducing a single-source protein with no fillers or grain for sensitive tummies, its long chew life and tendon that won't splinter or cause internal bloating like some natural bones and raw hide can. So, as far as bully sticks go, these did not disappoint! RECALL Alert! Just a week or so after our stix were delivered, "I and love and you" issued a voluntary product recall of their Cow-Boom! Strips because Salmonella was discovered in a routine sample test. I contacted Chewy.com to ensure their were no additional recalls in the works for other products and only after I was assured that the Bully Stix were safe did I allow the boys a taste test. It's so important to stay current on recalls and check expiration dates and storage instructions as many natural pet treats require refrigeration. Stay healthy my friends! Tip: Bully sticks of any brand might stain your rugs or upholstry; have the pups enjoy them on a hard surface or use a towel as a buffer. 1 Year of Freedom for Finn! 365 glorious, fresh air breathing, grass between the paw pads tickling, running, playing, exploring, full belly and snore-filled napping, treat-tasting days that Finn has spent being loved, cared for, freshly groomed and thoroughly doted on. Finn was a victim of the heartless and cold world of commercial breeding where his little 10-lb body endured 4 1/2 years of fear and discomfort. The puppy mill was located in Arkansas but his heroes hailed from Colorado. Enter, National Mill Dog Rescue (NMDR). In June of 2014, the NMDR rescue van full of loving and devoted lifesavers pulled Finn and countless other dogs from several locations around the South and Midwest. This would be the first step in his journey of life. Real life. Not caged, dirty, sick, starved, neglected life. After a rewarding and eye-opening volunteer trip in April 2014, I returned in July with my approved adoption application on file. You know, just in case :) I read the profiles of so many of the NMDR-rescued dogs and had a short list which included my beloved Finn. I spent the first day loving on all the pups at Lily's Haven (the NMDR adoption kennel), scooping poop, mopping pee, cleaning laundry and feeding my furry friends. I was quiety evaluating the dogs on my short list - Who will do best with Cooper? Who can fit in the under-seat carrier for the plane ride home? Who really needs me? Alas, my Finn was the one. What I have learned about Finn..
Salmon and flaxseed and turmeric, oh yum! These delectable Wellness TruFood CocoChia Bakes are chock-full of beneficial ingredients (including Coco for coconut oil and Chia for chia seeds) with none of that artificial junk. They are also grain-free, rich in antioxidants and, at about 1x1/2" or nickel-sized, they are perfectly proportioned for my boys. Chewy.com really nailed it with this month's recommendations. Being a new product and all, I don't feel that I can really ding Wellness for the packaging but I will say that I hope they look into resealable inserts in the future. These treats are naturally preserved so they should be refrigerated and I prefer to have things all sealed up before entering those preciously chilled chambers. Remember to treat sparingly and never replace full meals with treats, no matter how nutritious they appear. And love your pups! Chewy.com brought my boys a rare delicacy this month, Natural Balance Wild Pursuit Lamb Lung Bites. These all-natural, grain-free treats are high in protein but boast less than 8 calories per piece – even fewer if you account for the fact that I still break the bites into small bits for my pups. As will all treats, please do not replace entire meals and treat sparingly. Since the treats are dehydrated, there is no offensive odor. This makes it easy to store a few in my pockets for our adventures around town. It’s always helpful to reward good behavior on the spot. I might be guilty of bribing every now and again, too, but I’m not proud of it! We are so excited to review Merrick Power Bites Real Texas Beef Recipe Grain-Free Soft & Chewy Dog Treats for this month's installment of our chewy.com product review. These are an absolute FAVORITE among the Cusson canines! The bag of treats was decimated well before this post was even drafted.. nom nom nom! Merrick Power Bites are one of the easiest grab-and-go options for me when I strive for a successful walk around town. Successful is defined in my book as: no pulling, no lunging, no barking, minimal twisting of leashes. The boys love the flavors - we've also tried the Pork and the Turducken varieties - and I love that they don't leave an offensive odor in my pockets or on my hands. These 1/2 inch star-shaped bites are easy for the dogs to chew and digest which is also hugely important. And, at 5 kcal/treat, we don't have to tack on an extra mile just to work off their effects. Take a look at the ingredients; you might think you're reading a people food! Here's a review on the other "end" of the spectrum for a change ;) I received this wonderful package of Earth Rated® who not only has the coolest website around, but also supplied me with various poop bags, a dispenser and even the perfect "log" for my dog walker to record each day's "activities". I have found the cheapest cost per bag is roughly $.025. For Earth Rated, I noted a cost per bag ranging from $.032 to $.045 depending on which bags you buy, the quantity, and where you buy them. Over the course of a month or even a year, this is a fairly minimal difference. For me, choosing the lowest cost option of Earth Rated bags, I would spend about $45/year or less than $4/month for the 3-4 bags per day that Cooper and Finn require. Disclaimer: I received free product from Earth Rated in exchange for my honest review. The opinions expressed in the blog are my own and were not influenced by any outsider. I did not receive monetary compensation or additional benefits for talking about the product or the company. Natural organic treats for dogs - that's Max & Ruffy's tagline and it was enough to peak my interest! 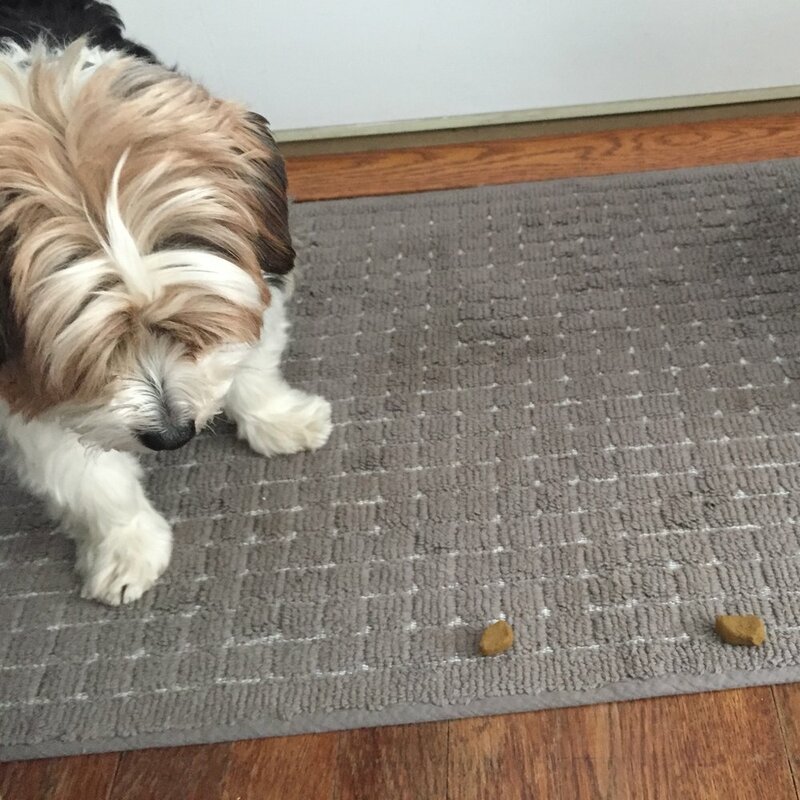 At the suggestion of a fellow animal advocate and founder of Pawz Ability, I contacted Max & Ruffy's to review their dog treats. Their customer service was second to none and the package of treats was more than I ever expected to receive! 2 full bags of their mini bites (perfect for my boys), 4 sample-sized tasters of their various flavors, and 1 bag from their new, sustainable, "super food" brand Petya. 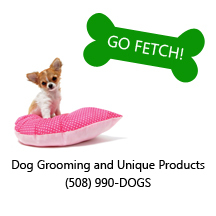 ...Our dog treats are always prepared using only certified organic, human-grade ingredients. We will never use any animal products. Disclaimer: I received free product from Max & Ruffy's in exchange for my honest review. The opinions expressed in the blog are my own and were not influenced by any outsider. I did not receive monetary compensation or additional benefits for talking about the product or the company.